Wanted to buy a galvanized or aluminium boat trailer for a 18’ boat. I have for sale one boat trailer capable of taking up to a 22 foot boat I have currently been taking a 20 foot sea runner with 2 50hp four stroke motors with no issue at all the trailer runs perfect on the highway been using it all winter at the turrs. Comes with Lights Drop down jack Boat guides Not registered. Wanted Auto Pilot. To be used on 45 foot boat. Refurbished Turbo Stainless Steel M14 1/4 x 17 Boat Propeller - Mercury!!! Wanted: Anchor Windless to fit 45 foot pleasure boat. Hydraulic or 12 volt electric. Anyone looking to have boat numbers and names done.. commercial quality vinyl with 5year + outdoor rating. Can ship anywhere. All you have to do then is install yourself. Very economical!! Need more info let me know! FOR SALE.----29' 11 fibreglass boat for sale. Registered for 29'. Boat is 10' 11 wide. Fibreglassed outside 5 - 6 years ago. Wood taken out and fibreglassed inside 2017. Hasn't been in the water since being fibreglassed in 2017. 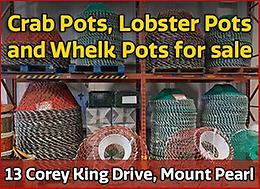 Used for crab and cod in Conception Bay. Can hold 4500 - 5000 lbs of iced crab. Retired in 2017. $10,000.00 ono. MUST GO. ALSO FOR SALE----2014 70 HP Yamaha 4 stroke outboard. Excellent condition. Used 4 summers 2014 - 2017. Fished crab and cod. $6500.00 ono. Boat with a 3408 Cat engine 400 hp. Call for info. I have for sale a 29ft 6in open motor boat with a 22 Lester rebuilt 5 years ago and had little use since then,has been left in the boat that has been hauled up since then and is in good condition,there are plenty of parts to go with the engine including a spare transmission. The boat also will go with the engine ,the boat is fully fibreglassed outside a great spring hobby to gut it out and fibreglass the inside for $2000 you would have a great boat and engine.